I mentioned a few posts ago that I've been creating a new "blogfolio" (a combination of a blog and a portfolio). It's not quite finished yet, but here it is. It gives an overview of about 45 design projects that I've done over the past 4 or 5 years. The blogfolio needs a bit of re-ordering, but comments are welcome! Just read this by Ed Curran in today's Belfast Telegraph, which builds on an article from Alex Kane which was in the News Letter a few weeks ago (the News Letter site is down today, but his article is discussed here), which in turns picks up on some thoughts I had written as part of this November 2007 post on this blog). I'm sure that the 12th is a debate/discussion that has a long way to travel. If (in a secular sense) the future of Northern Ireland society depends on a new articulation of our history, and identities, then the next number of years will be very interesting. 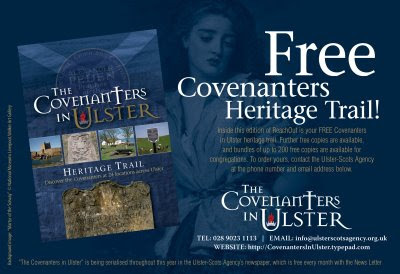 And, to whet your appetites, the next two articles about The Covenanters in Ulster which will be published in The Ulster-Scot have the potential to be absolutely central in our community beginning to rethink its past. PS: I don't necessarily agree with what these two are saying, but the discussions themselves are interesting. There's always one - a slow one that's miles behind all the rest. This wee frog was released tonight, the last of our batch. All the others (49) went about 2 weeks ago, at which stage this one was still just a big blob of a tadpole with back legs, a big tail, but no sign of any frog characteristics and not even any wee stubs for front legs. We thought that he must be a mutant, one that would have died already if he'd been in the wild, and we didn't hold out much hope for him. So for the past two weeks he's been swimming about all by himself, nibbling on wee bits of raw fish. Then all of a sudden he started to change, front legs and eyes emerging, tail shrinking, a late developer making up for lost time. A week ago he was still a tadpole with legs, but here he is earlier tonight sitting on my hand, on his way to the corner of the field where all of the rest were let loose. So there are (hopefully) 50 wee froglets leaping about at Ballyfrench, the first generation of a new breed. Had quite a few emails from people asking for recommended brother duets style CDs. As a starter, I'd suggest the brilliant Prayers from Hell - White Gospel & Sinners Blues 1927-1940, which is available in some specialist record shops and also here from Amazon.com. Here's a review. It includes the wonderful track What Would The Profit Be? by the Monroe Brothers, who were Bill and Charlie Monroe. They recorded as a brother duet in the 1920s and 1930s, before Bill created the high-speed picking style that became known as bluegrass. I've spent the last few days revitalising the Covenanters in Ulster site. 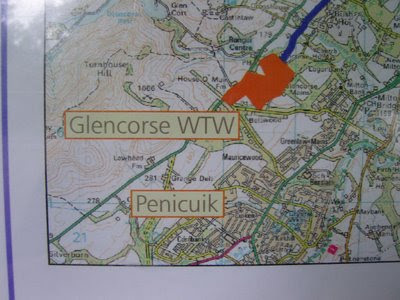 Still need to do some work on the GoogleMaps version of the forthcoming heritage trail. 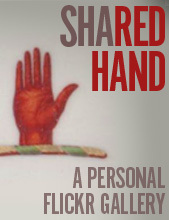 Click here to visit the site. Some time in the late 1400s there was a man in the district of Kyle in Ayrshire (to be precise, in Hardhill in the parish of Loudon) called Murdoch Nisbet (1470? - 1558). Not much is known about him, but he had a mighty impact in his day. He is believed to have been a "notary", a high-ranking civil servant. But he had another, some might say subversive, side. Because Murdoch Nisbet's faith and personal conviction led him to defy the norms of his time. Murdoch was a Protestant, to be precise, a Lollard. Protestant ideas were not new to Scotland - there had been some Protestants in Scotland before Murdoch's time. For example, an English ex-Franciscan monk, James Resby had been burned at the stake in Perth in 1407, and around 1433, a Bohemian/Czech Protestant called Paul Craw had been burned at the stake in St Andrews. Anyway, wherever Murdoch Nisbet ended up, whether it was England, Germany or Ulster, he took with him a manuscript that he'd been secretly working on - a translation of the New Testament into vernacular Scots. He translated from Purvey's 1395 revision of Wycliffe's Bible. It's not known how long Murdoch was away from Scotland, but when he came back with some other Lollards who had also fled, the persecution was still underway. "... Murdoch, being in the same danger, digged and built a vault in the bottom of his own house, to which he retired himself, serving God and reading his new book. Thus he continued, instructing some few that had access to him, until the death of King James the V (note: James V of Scotland died in 1542, aged just 30, probably from cholera) ... Murdoch, tho' then an old man, crept out of his vault and joining himself with others of the Lord's people, lent his helping hand to this work through many places of the land, demolishing idolatry where ever they came..."
Nisbet's house had been sited on land that later became Loudoun manse glebe, at the curve of a burn. Apparently there are old foundations still there, marking the location of the building. Murdoch died in 1558 (the year before John Knox's tumultuous return to Scotland from Geneva) and left his New Testament manuscript to his son Alexander Nisbet, who left it to his son James, who left it to his son John. This John Nisbet was a soldier of renown, and was at Scone when the duplicitous King Charles II swore the Covenants in 1650 as part of his scheme to exploit the Covenanters and to use the Scottish throne as a stepping stone to what become his Restoration in 1660. 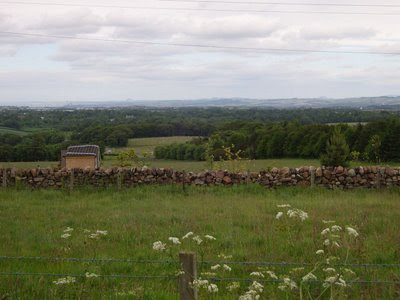 John became a famous Covenanter hero, he was at Lanark in 1666 as the Covenanters marched toward Edinburgh and ultimately the Battle of Rullion Green. "received 17 wounds, was stript naked and left for dead, yet as much strength and life reserved, as enabled him to make his escape in the night, tho' it was a twelve month before he recovered. At Drumclog he did good service, behaved to a wonder, yet was preserved; at Bothwell he fought openly and boldly..."
Time went on and John Nisbet listened to great Covenanter preachers like Donald Cargill, Richard Cameron and James Renwick, and through the persecutions of the early 1680s "...he contended against the sinful compliance of these times..." He was martyred aged 58 at the Grassmarket of Edinburgh on 4 December 1685, leaving three sons, Hugh, James and Alexander. Anyway, Murdoch's old manuscript was passed down to James, who was a Sergeant at Edinburgh Castle, who gave it to Sir Alexander Boswell to keep in his library at Auchinleck in Ayrshire (only 10 miles away from where Murdoch had written it nearly 200 years before). It stayed here until 1900 when Lord Amherst of Hackney allowed it to be published by the Scottish Text Society. The manuscript is today in the collection of the British Museum. Murdoch Nisbet is remembered today in his home town of NewMilns in a number of ways - a small award-winning housing development is named after him, there's a plaque inside the local church, which is also the same church that has a number of Covenanter memorials, including one to Murdoch's descendant John Nisbet mentioned above. Good to see there were what we now call "living history" projects on Covenanter themes over 60 years ago! Here's a photo of John Nisbet's memorial at Loudoun Parish Kirk in Newmilns, photographed back in February. As if Jacob's home-made hairdo wasn't bad enough, look at his two mates! The family wait with excitement! In an era of slick branding (which is my day job and once I get my new blogfolio finished I'll post a link here for you all to see and judge), hand painted typos have a certain charm. Carrying on from the oyster post, I bought three of these old Guinness bottles a few years ago on eBay - I'd been trying to track one down for years. Bet they don't produce this brand any more! I also found this old pub sign in Belfast, but sadly long since gone. If anyone knows anything about this brand, get in touch. Is the Hillsborough Oyster Festival the stupidest-ever idea and location for an event? It has been going now for years, a corporate platform created by Guinness to give the rich and aspirational something to do for a weekend, bringing to life one of their corporate photo library images that appears in every Oirish tourist publication produced these days. The irony is that you can't actually get oysters in Hillsborough. Or fish. Or crab. Or lobster, or any other kind of seafood. Because Hillsborough, as most people know, (according to GoogleMaps) is far inland - about 15 miles from Belfast and about 20 miles from the nearest sea inlet (Strangford Lough). And as for the nearest oyster farm where the things are actually available, it could be as far away as Donegal! They must have a really tough time landing all those baskets of fresh oysters at the quayside in Hillsborough. Some will claim that the Ulster Fry is our national dish. Partial as I am to a good fry from time to time (a real one has fried pancakes and vegetable roll*, none of this hash browns and black pudding nonsense - be wary of people who seek to deviously subvert and internationalise the Fry), I have long believed that there is one other food, an unsung hero, to whom the title of Ulster's National Dish truly belongs. It's not yellow man. It's not Tayto crisps. It's not even Bushmills whiskey. No ladies and gentlemen, I give you (drum roll.....) the egg and onion sandwich! No church tay meetin, Sunday School social, family picnic or Twelfth day can be considered truly complete without some egg and onion. It has been the staple of Ulster Protestants for many generations. I was delighted to see one of the food vans in the field at Portavogie had restored egg and onion to its rightful position - jostling for orangey-yellow attention with the modern day bacon & cheese burger, and placed above the chilli chicken burgers! This particular van owner was obviously a man of considerable insight, as he was also selling tea and buns. You'll never get that at a McDonalds franchise. So impressed was I, that I was even prepared to tolerate the (frankly unnecessary) innovation of the egg and onion bap, as a substitute for the standard egg and onion sandwich, on the basis that he had described it using the traditional term "bap", not a roll, and that he hadn't overstepped the boundary by going for something as poncey or elitist as a baguette, panini or (sharp intake of breath) a wrap! So I paid my £1.50 and took a bite - boysadear, the perfect egg and onion! Hard boiled egg (not scrambled) raw white chunky onion (not the scallion substitute, and not finely chopped), and real butter (not mayonnaise or salad cream). All's well in the world when traditional egg and onion still exists as a menu option for Ulstermen. Had some conversations recently about the changing face of Orangeism and the 12th celebrations. Lots of articles have been published in the last few days, mostly in two camps: a) things are changing and it's great, or b) so much for the supposed change, the Lisburn Road was still swimming in alcopops. The third position is Rev Stephen Dickinson's, which has been explained here, here and here. At great risk of sounding like a fence sitter, I have sympathy with all three views - yes some good moves are being made, but sadly there is still an alcohol culture at some stretches of some parades (as is the case generally in society), and be very wary about dumbing down, losing authenticity, and losing the core values. (I didn't see none of that fancy Orangefest branding in Portavogie!). ...I wonder if Heather got much trade from the Lodge members? Went down to the harbour last night, where the local community association had organised a (gas powered) beacon to be lit, a short performance by the flute band, and a firework display for the traditional 11th Night celebrations. It was a beautiful evening, and the intention was that the beacon could be seen in Scotland. A nice simple event, plenty of local folk to yarn with, but Maggie couped and skint her wee knees so there were some tears and yelling, but all in all a nice evening with no drink or nonsense. In April 1641, the authorities in Ulster reported ‘disorders lately attempted by some of the inferior sort of the Scottish nation in the Counties of Down and Antrim’. Copies of Scotland’s National Covenant were circulating in Ulster - one of the suspects who had been arrested reported that ‘that there was such a scroll, and that it had been carried through the country and signed by 1,000 people and more’. Ulster Scots also protested at parish churches, and rumours abounded that the ‘rowtes’ (riots) in Antrim and Down had been instigated by ‘beacon fires on the Scotch Mountains’. As events escalated King Charles I acknowledged that he had heard news of ‘the Scotch rising in Antrim and Down… in contempt of the State and Established Church’ , ordering his forces in Ulster ‘to stop outrages, you shall declare martial law wherever you use troops’..."
I was invited to speak in Portavogie Community Association on Tuesday night on an Ulster-Scots subject of my choosing. So, true to form, I opted for Hamilton & Montgomery. I've delivered versions of that talk in nearly 30 places across Ulster (NI and RoI), but this was only the second time in the Ards Peninsula, which was the epicentre of the Hamilton & Montgomery settlement of 1606. There were nearly 50 people out, and I spoke for about 45 minutes. I knew a good few of them, mostly familiar faces from our rural Ulster-Scots community. My friend and neighbour John Adair was there (Stephen - you can tell him he's now been mentioned on my blog! ), David McKee from Kirkistown Pipe Band, Wullie Palmer the local mechanic, Emma Graham, Bert McMaster, the Birches from Bishopmills, Hilary Donnan - all good down-to-earth local folk. Probably all descended from Scottish settlers, maybe even the original people that came with Hamilton & Montgomery. They told me they enjoyed the talk, especially when I showed them the 1625 Thomas Raven map of Hamilton's settlement at Portavogie, along with the rabbits on the Warren (it's still called that even today). What was refreshing was that in the middle of all the bureaucracy, the Irish News and BBC Radio Ulster "Talkback" hype and nonsense and attacks on Ulster-Scots, the ongoing need to justify the existence and validity of Ulster-Scots to the chattering classes - these folk in Portavogie need no convincing. And when I explained that in other places some audiences need to be convinced of Ulster-Scots, they thought that was ludicrous! These people ARE Ulster-Scots, as are similar communities across Co Down, Co Antrim and other places too. I'm glad to see the folks in Portavogie improving their 12th calendar this year with simple but good quality events, a historical photographic exhibition in the Orange Hall. I hope it grows into something regular - not bigger, just regular. Because big usually becomes trivial and gimmicky; small is authentic. 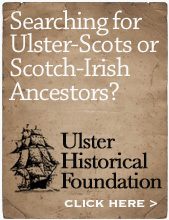 The community is where the real Ulster-Scots exists. Pray for sunshine on the 12th and Portavogie will be buzzing! The picture below, from the Portavogie 12th of 1935, shows that the locals have never lacked creativity or imagination! Hilary has learned to play the guitar and has bleached her hair. I need to lay off the Mars bars. It's not all Covenanters and Ulster-Scots in our house! For some reason, in my lifetime, the frog population of the Ards Peninsula has diminished massively. But as you might expect, once the excitement of gathering the spawn was over, the following 4 weeks of peering at a mass of jelly with wee black dots in it to see if any had hatched was pretty boring stuff, so the boys lost interest and left the whole project to me. Earlier this week, we released our first 10 "froglets" into the wild, in a damp corner of a field on the family farm at Ballyfrench, close to a well that's been there for at least 100 years, so they should stay well hydrated (never mind the torrential rain we've had this week). Here's a picture of them in the jampot we transferred them in, with a 50p to give you an idea of size. They're so small they could perch on your fingertip. Already they can leap pretty big distances - when we took the lid off the jampot they were scrambling over yin anither tae get oot, doing big leaps from the rim of the pot into the damp grass. Just this afternoon we released another 10. In total, we still have another 30 adult tadpoles swimming about, so by the time the rest are released we'll be repopulating Ballyfrench with a new frog colony of 50. It's like the frog version of the Hamilton & Montgomery Settlement of 1606! Hopefully they'll thrive, survive the winter, and breed next spring. Another BBC programme which was broadcast recently was Shopping for England, a documentary presented by the cultural historian Mica Nava about the rise of the retail revolution in the British high streets of the early 20th Century, specifically Selfridges and Woolworths. Selfridges is perhaps the uber-retailer of this generation, a style mecca that guarantees commercial kudos for any company that manages to have a product listed there. I didn't see the programme, but I'm told that the current generation of the Selfridge family were interviewed, and during the interview they repeatedly referred to Gordon Selfridge's (1858-1947) Ulster-Scots roots and work ethic being what gave him the drive to succeed in business. They've only got four stores, with a possible fifth to be opened in Dubai. Perhaps (some day) one in Belfast?! Thanks to Nelson McCausland for this tip - a 2 hour BBC4 documentary that was broadcast last week on the history of Sunday Schools. I haven't watched it yet - here on the BBC iPlayer. I think they might remove this after seven days, so watch it quick! This poem is from the booklet "Poetry of Avondale", No. 4 in the Avondale Guides series by William D Howat. I bought this at the John Hastie Museum in picturesque Strathaven when we were away. The museum has a room dedicated to the Battle of Drumclog with interpretive panels, scale models and artefacts. And, the added bonus is that it's on the edge of a superb park with big lawns, boating lake, bowling green, playground - all the stuff to tempt the weans with, and to use when striking a bargain of "now, be good in the museum with your Da for half an hour and I'll take you to that great park afterwards!" I's bear the wyte o't yont the grave. An' worship as the King does want! Shall this be tholed? Na, damn the fears! The King shall hae his richts; but dod! An' mells na wi the things o' God. An' listed wi' the Lord o' hosts. We'll up an' gi'e them dunt for dunt. An' faith! They werena sweer tae rin. We gat oor paiks at Bothwell Brig. Oor prayers gang stracht to God in Heaven. 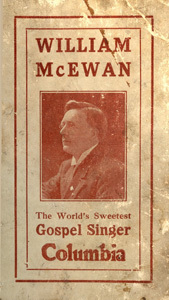 The author of the poem is unknown, but in the booklet it says it may have been written by William Cleland. I'm no expert, but I doubt it was Cleland - the language looks more like late 18th / early 19th century, rather than the late 17th / early 18th when Cleland wrote his poetry. But I could be very wrong! The weans' reaction was interesting. I have told them the story of the drowning of the two Margarets many times, but being there, seeing the Solway Firth, standing by the graves, really brought it home for them. After seeing the graves we were heading back to the car, and Charlie spontaneously said "Dad, we have to leave flowers on the grave!" and he dashed off to a big clump of wild daisies. He tugged a few out and went back to the graves. I ran after him. By this time Jacob had arrived too; Charlie looked up at me, almost seeking approval, and then (because he's wee) slipped through a gap in the railings that surround the graves and laid the flowers on the flat gravestone. It was a lovely moment with the two boys joined in a simple, instinctive, childlike act of remembrance at that most special of places. Spotted this on the Bank of Scotland building in Ayr High Street. 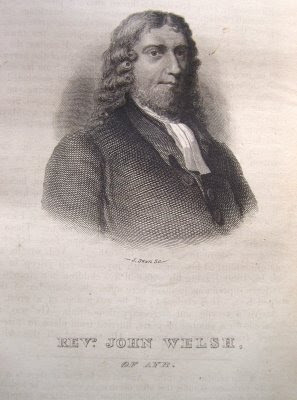 John Welsh (1568 - 1622) was married to John Knox's daughter, and their son Josias Welsh was minister at Templepatrick in County Antrim from about 1622 onwards. When are our local primary schools going to have names like this?! 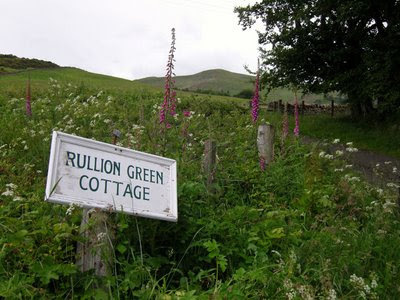 Arguably the most important event in the Covenanters in Ulster story is the Pentland Rising, also known as the Battle of Rullion Green. Back in February I spent most of a morning trying to locate the monument. 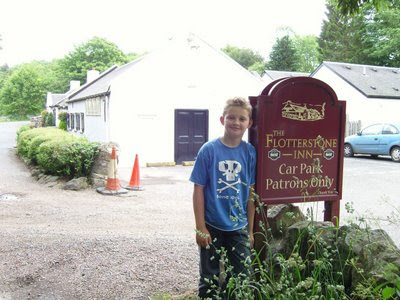 Last weekend I went back with the sole purpose of taking my children there - part of the cultural education programme. Fought on 28 November 1666, the Covenanters were led at Rullion Green by Colonel James Wallace, a veteran of the Covenanter Army in Ulster during the 1640s, during which time he was Governor of Belfast for about 2 and a half years. He married one of the Edmonstones of Ballycarry in County Antrim. However, for all his military skills, the Covenanters were greatly outnumbered by a heavily armed Royalist force led by General Tam Dalyell, who was also a veteran of the Covenanter Army in Ulster but who had conspicuously been the only man to refuse the Covenant at the great public event at Carrickfergus in April 1644. The Covenanters were cut down, and of the fifty-odd who were killed, only two are named on the small monument - Rev John Crookshanks of Raphoe and Rev Andrew McCormick of Magherally near Banbridge. 80 Covenanters were taken prisoner and soon after were executed. If you want to go to see the monument at Rullion Green, I hope these instructions are of some help - they're about as accurate as I can make them. Hopefully this will save you time and frustration in trying to track it down. 1. 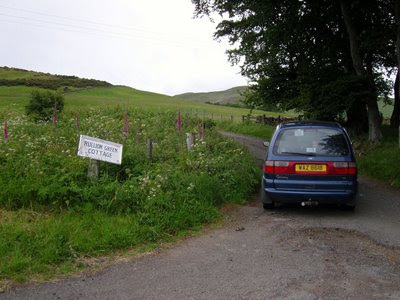 Follow the A702 from Edinburgh to Biggar. 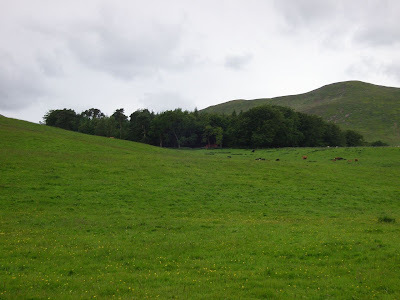 Just behind the town of Penicuik is Flotterstone Visitor Centre (part of the Pentland Hills Regional Park). There's a good wee restaurant/pub nearby with a garden that can sell you a good family feed! 3. 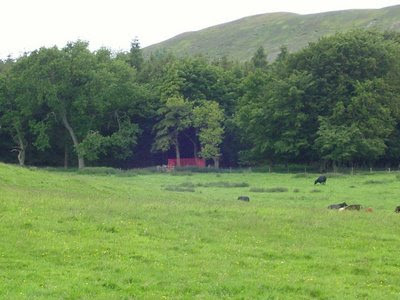 Standing in the yard of the Cottage, look uphill towards a small copse of trees. In the middle of these you'll be able to pick out a red shape - these are the railings that surround the small monument. 4. Then set off up the hill, it's about a 10 minute walk and pretty straightforward. The monument is modest, but well worth seeing, along with the interpretive plaque that was erected there in 1966. The views from the monument sweep down the Pentland Hills towards Edinburgh, and are spectacular on a clear day. There must be a good argument for the relevant public authorities to create better access and a small car park / viewpoint close to the monument. 2016 will be the 350th anniversary of the Pentland Rising. For those who read this blog and are interested, I know that's eight years away, but with eight years of planning time available, something very special could be done in 2016, on an "east-west" basis, to mark the anniversary. Here's a link to GoogleMaps - click on the marker near Edinburgh for a pinpoint location that's about as accurate as GoogleMaps will provide.